In 2014, the University of Alberta’s H.T. Coutts Education & Physical Education Library and the Faculty of Education partnered on a campus book club known as On the Same Page, with a focus on building community through books. On the Same Page invites students, professors and staff to read and discuss a designated work of Canadian literature, which may also be assigned reading in certain courses. The book club’s first selection was Indian Horse: A Novel by Richard Wagamese. For 2015-16, the book of the year was The Inconvenient Indian: A Curious Account of Native People in North America by Thomas King. Both books deal with Indigenous perspectives and experiences such as residential schools and living on the land, and both confront issues of relevance to teachers and contemporary schools, such as racism, history, media and sport. 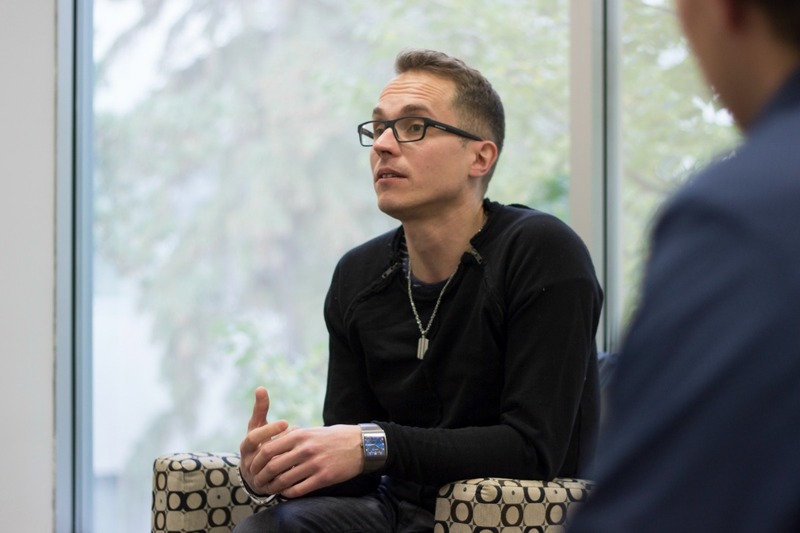 Jonathan Anuik, assistant professor in the Department of Educational Policy Studies and a discussion leader for On the Same Page’s book clubs, talks about how such book club meetings can create spaces on the grassroots level for advancing the work of reconciliation with Indigenous peoples, which is a focus of the University of Alberta at the institutional level. Faculty of Education: Book clubs are not uncommon on post-secondary campuses. How did you hit upon the idea of using a book club to explore Indigenous issues and perspectives? Jonathan Anuik: I was actually out shopping one day, and I was talking to the sales clerk about the research I did. We were just talking, and I told the guy about Indian Horse. I said ‘Why don’t you read the book?’ This was about eight months after the Truth and Reconciliation Commission issued its summary report—it’s a huge volume, it’s almost 600 pages, there are many, many recommendations. So I was thinking how do we get it out to people like the sales clerk at Club Monaco? Then I thought, why not talk about the potential of a book club, an informal space, as a springboard to discussion about how people can affect the mandate of reconciliation at the grassroots? I’m a firm believer that it has to be relevant to people on the ground. There’s institutionalizing reconciliation, but I think things become more meaningful when people can experience and feel a part of something such as a book club. I think the faculty chose Indian Horse and The Inconvenient Indian because both focus on Indigenous issues in education, which is a focus of the Faculty of Education and Alberta Education. Alberta Education is revising its teacher quality standards and standards for school leaders, and one-third of the draft criteria mention Indigenous peoples’ education. Anuik sees book clubs as a space for more open conversation. "When you take away the pressure of grades and assignments, you can sometimes open up a whole new outpouring of information, knowledge and understanding." From l. to r. head librarian of Coutts Library Katherine Koch, Anuik and Education student John Evjen. Faculty of Education: If students are going to be studying these books in class, why might they want to also discuss them in a book club setting? JA: One thing with a book club is the promise of the extracurricular stuff that isn’t necessarily for evaluation. That’s one area I’m very fascinated by. What we do in Indigenous education, it’s not designed to be subjected to a rational way of understanding, it’s a journey that you’re taking part in. When you take away the pressure of grades and assignments, you can sometimes open up a whole new outpouring of information, knowledge and understanding. Faculty of Education: How does a book club complement the content and discussions students are taking part in as part of their coursework? JA: I personally see participation in book clubs as part of the student experience. One of the challenges we face is what kind of activities do we set up that enable students to participate and to see it as a forum without having to attach some kind of reward to it. And one of the objectives of On the Same Page is to build community. Part of being in a professional program like education is being in a community of practice, so we want them to be a part of that community. Faculty of Education: How does the content of the books you’ve chosen for On the Same Page facilitate dialogue around reconciliation? JA: One of the things that came out of reading The Inconvenient Indian with my first-year students last year was that one of the worst things you can do to someone is take away their right to expression, their right to identification—which is what happened with the Indian Act and residential schools. These books provide good opportunities for people to see what happens when your identity is taken away from you in the name of progressing you through the educational system to become a productive member of society. I think books like these can help pre-service teachers start to think about the impact and that they can perpetuate that or they can start to change. No one expects them to change dramatically or to have all the answers, and that’s why the setting of a book club can be very comforting—you can share as much or as little as you want. Sometimes students just listen, and that’s a form of engagement too. Faculty of Education: What do you hope participants will get out of the kinds of discussions you have in On the Same Page? JA: One of the biggest impacts over my years of teaching is when students tell me ‘I never would have read that story on my own,' or ‘I never would have thought of that community in the light of being an Indigenous community.’ They wouldn’t have done that had they not been reading a book or attending a class or taking part in a book club discussion—those things are to me the greatest benefit because then they start paying attention. They’ll click on that story on CBC, or they’ll pay more attention to anything involving Indigenous people. We place a great emphasis on mastering knowledge, but in the case of reconciliation, all that people ask is that you pay attention and start to educate yourself, start to think, start to experience some empathy. While the institutional mandates are changing the campus at the top to be more inclusive, people have to want to take part. Feature image: Education professor Jonathan Anuik leads one of the On the Same Page discussion circles at H.T. Coutts Library in early October 2016.